A 17th-century painting was left with a large hole in it this week when a 12-year-old boy fell into it. CCTV footage from Huashan 1914 Creative Park in Taipei shows the child stumble in front of the work (which is on loan from a private collection for the exhibition ‘Face of Leonardo: Images of a Genius’), knocked off balance, rather ironically, by a low barrier designed to keep visitors at a safe distance. He puts out his hands instinctively to steady himself, only to accidentally punch a hole in the bottom left corner of the canvas before righting himself and looking more than a little shamefaced at the damage. In 2010, Picasso’s The Actor – from the artist’s Rose period – suffered a 15cm tear after a woman fell into the $80 million work at the Metropolitan Museum of Art. Luckily the damage was regarded as unobtrusive given that it was localised to the lower right-hand corner of the painting. The work was repaired in time to be included in the ‘Picasso in the Met’ exhibition, scheduled for later that year, which featured some 250 pieces by the Spanish master. Last year, in pursuit of the perfect selfie, a student clambered on to an early 19th-century statue at the Brera Academy of Fine Arts in Milan causing its leg to fall off. Fortunately the sculpture was a copy of an ancient Greek work from the Hellenistic era depicting the Drunken Satyr and was surrounded by other more valuable works of art – including pieces by Antonio Canova. It’s unclear whether the student was able to snap the photo before the unfortunate amputation. A girl visiting the Israel Museum during the school holidays this summer broke a 2,000-year-old, Roman glass vessel. Haaretz reports that the vase, part of a recent donation from the Robert and Renee Belfer Collection to the Museum, already had an old crack in the base, which had been repaired. The girl apparently clung to the glass case holding the vase, thus shaking the vase inside the case. It broke along the crack, but the Israel Museum has been able to repair the vase in its lab and declares it as good as it was before. 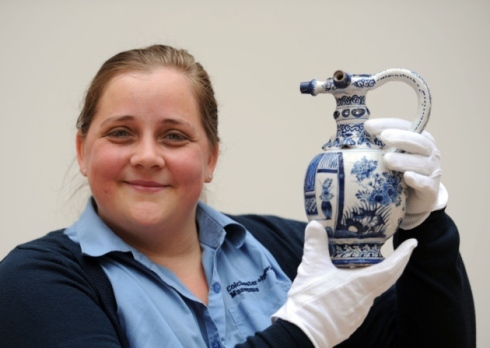 In June, staff at Christchurch Mansion in Ipswich took to social media to track down a child who smashed a 221-year-old Delft jug in their collection – but not to reprimand him. The boy had apparently been ‘distraught’ when he knocked the item off a shelf last summer, causing it to break into 65 pieces, and they wanted to reassure him that conservator Carrie Willis had put it back together again. Eventually they heard from the mother who said how delighted the family were to see it back in one piece. Twitter is up in arms about the parents who allowed their child to climb on a Donald Judd artwork at the Tate Modern. Where were the guards? Museum Etiquette: are there manners in museums anymore? Clumsy gallery goers or very bad exhibition design? It’s more than obvious on the first video that we are setting traps for visitors, isn’t it?